Hello, I am doing a debate about Genetically Modified Foods and I am on the consequences. I have researched a lot but all the illnesses that appear to be caused by GM Foods have no evidence. What arguments can I use in my favour? Thank you for your request. Actually, GMOs are safe. Many consumers are led to believe that GMOs can cause cancer, autism, gluten intolerance and other illnesses. However, this couldn’t be further from the truth. Every leading health organization in the world stands behind the safety of GMOs. Extensive and continuous studies on GMOs are being conducted to ensure their ongoing safety for consumption. Click here to find thousands of studies on the safety of GMOs. Click here to find hundreds of independent studies. In the spring of 2016, The National Academies of Science, Engineering and Medicine (NAS) researched the question, “Are GMOs Safe?” and concluded: Yes, GMOs are safe to have on our plates and in our environment. 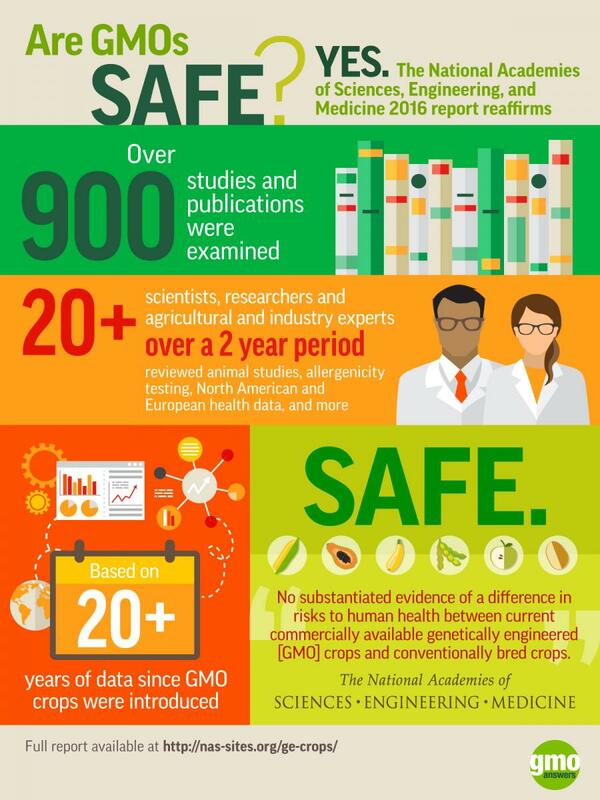 The below infographic details how more than 20 scientists, researchers, agricultural and industry experts reviewed over 20 years of data since GMOs were introduced, including nearly 900 studies and publications, animal studies, allergenicity testing and North American and European health data. To many, GMOs are considered an important tool in addressing complex issues around the globe. From environmental sustainability to nutritional benefits, we’ve outlined many of the important ways GMOs can provided benefits to farmers, consumers and the environment in the response posted here. We have a variety of other resources available throughout the GMO Answers website and encourage you to explore more. Below are a few additional resources on this particular topic that you might find interesting.